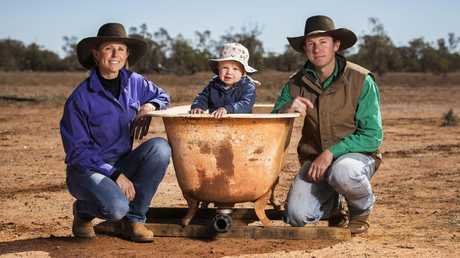 GRAZIERS Sasha and Will Treloar can't avoid the glaring red dirt of the killer drought gripping Queensland with only the distant memory of their land under lush green grass fuelling hopes of a return to the good times. Boothulla station near Cooladdi, just west of Charleville, hasn't had any decent rain since 2011. The property has gone from gleaming green grass to a wasteland of dust and dirt in one of the shortest rain to drought turnarounds anyone in the west can remember. Will's mother and father Michael and Judy are on the property next door and little Campbell has been added to the clan, turning one this week, so the family are in it for the long haul. 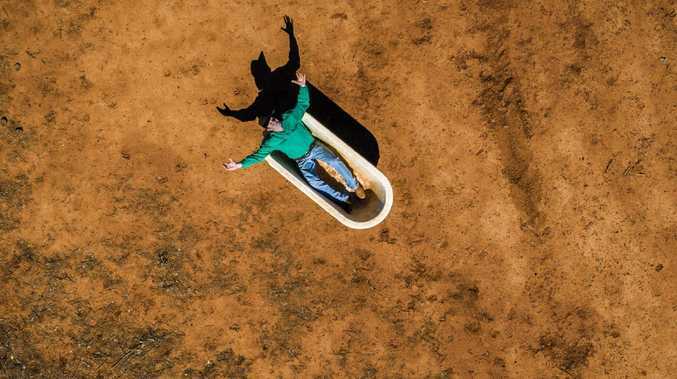 The family reckons they and the 180,000 acre property will make it through to the other side of the crippling drought, but others are hurting and in desperate need of help. 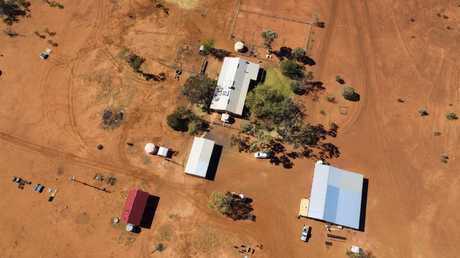 That's where Queensland Drought Appeal can ease the burden on families in the bush who are hurting while they wait for rain. "Any help is good help," Mr Treloar said. "Getting money back into the community will help the community." 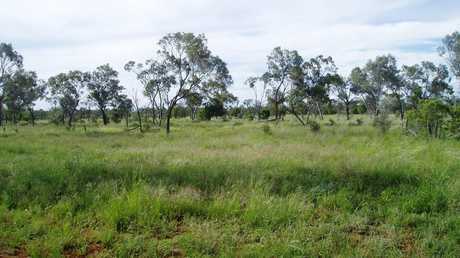 Ms Treloar said community groups like Rotary and the CWA had been helping those who needed it through the six grinding years of this drought but every bit extra helped keep the bush alive. "They've been pretty bloody amazing," she said. Mr Treloar said he thought back to the good times to help him keep going. "As long as you stay positive, the rain will come eventually," he said. 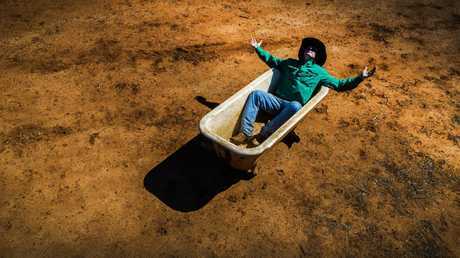 But he said others were struggling with a drought that has hit them on "financial, emotional and all levels". "Getting negative, that's when people can end up in dark places," he said. Boothulla at Cooladdi, pictured in greener times in 2011. Ms Treloar said pressure to find work had forced some bush families apart with one partner moving east to earn money while the other stayed to maintain the land. She said it was dangerous working alone on such big stations, but some graziers saw little choice but to take chances on cutting down fodder with chainsaws a long way from help. "It's really frightening," she said. 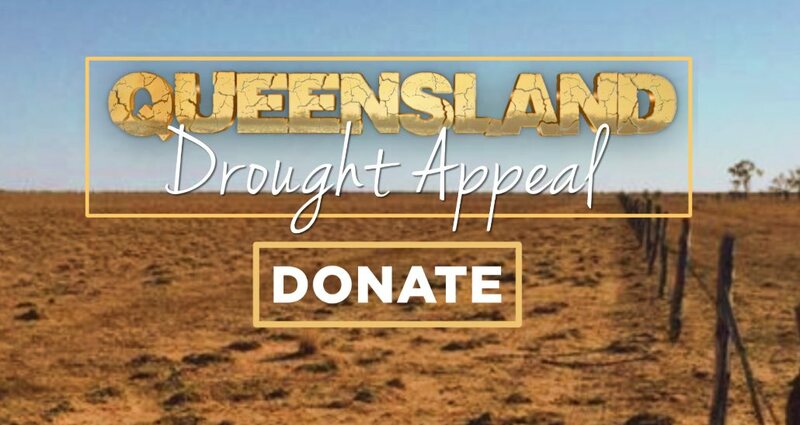 ALMOST $400,000 was raised for the state's struggling farmers in just the first 24 hours of the Queensland Drought Appeal. Premier Annastacia Palaszczuk kicked off the appeal on Thursday, with The Courier-Mail and The Sunday Mail joining forces with 7 News, the Ekka and the Queensland Country Women's Association to launch the bid to turn around the lives of farmers across the state struggling with a crippling drought. The appeal had raised $389,587 last night after major energy player Santos chipped in $116,000, and oil and gas company Shell contributed $100,000. The State Government also gave $100,000. Agriculture Minister Mark Furner said to have these companies come on board and support Queensland farmers just a day after the Government launched the appeal was "wonderful". "Already we are approaching $400,000 raised which is an astonishing amount after 24 hours, and I want to thank everyone who has donated so far," he said. "But there is still a long way to go and every cent counts, so I urge Queenslanders to dig deep. "This money will go to the Queensland Country Women's Association to be spent on the ground in rural and regional Queensland communities."